Check out the results of Glidecoat ceramic coating application after 1 year application on a 2003, 29 foot SeeVee. In August of 2016, we were asked to coat a 2003, 29 foot SeeVee that had been sitting at the same dock in South Florida for 13 years. To make matters worse, the boat was docked with the port side facing north, so exposed to the sun all day, everyday. As a result, the port side was a lighter yellow than the starboard side. The owner has been considering painting the boat at a cost of $10,000 prior to learning of Glidecoat’s Ceramic Coating Process, which was a fraction of the cost. After going through the various steps to prepare the boat including, Glidecoat Wash, Glidecoat Compound, Glidecoat Polish and finally the application of Glidecoat Ceramic Coating, the gloss meter readings on the hull went from single digits to a high of 86.9 on the boats port side. In addition, the hydrophobic effect helped keep the boat, free from things such as leaf stains (the boat has a tree covering the starboard side) salt, dirt, fish blood etc. Exactly a year later the owner invited us back to check the boats progress and see how the boat had changed since being coated in August 2016. What was more than evident was the level of gloss, but also the continued hydrophobic effect that was evident on the hull. 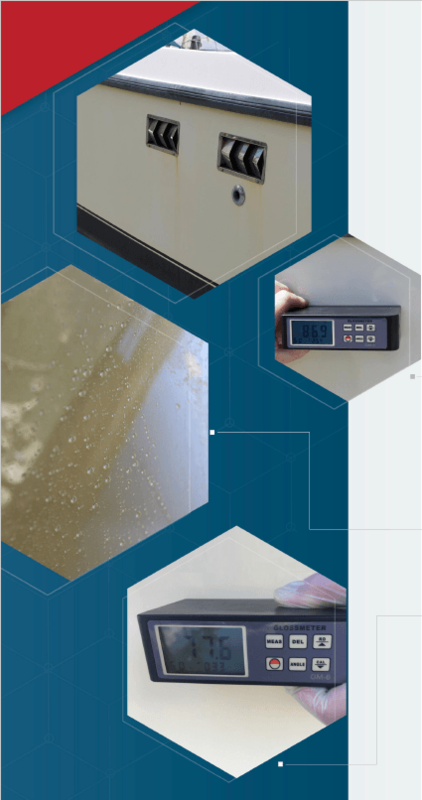 Gloss Meter readings on the port side which has been exposed to the Florida sun the last year came in at 77.6, which reflects a reduction in gloss of 9.3%, which is minimal given the continual exposure. Over the last year, the owner has performed limited maintenance on the boat, simply washing lightly with Glidecoat Wash.
To help maintain the coating going forward, we have recommended the owner apply Glidecoat UV Shield and Shine, which is a soft polymer product with an MSRP of $29.95. This product when applied on top of Glidecoat Liquid Crystal will help further reduce UV damage and maintain the hydrophobic effect, as well as shine extending the life of the top coating to well beyond 2 years. With preparations begin to unwind for season’s end, now is a great opportunity to recommend your clients on the positive affects of Glidecoat. If you are interested to learn more, email customer@glidecoat.com or call 561-290-0165 and one of our team members will assist.